We were bemoaning the fact that our camera doesn’t have a recording device and suddenly realized that our MP3 player does! …thank goodness for the internet and the several people who posted tutorials on how to edit movies in Windows Movie Maker. It’s not perfect syncing but it’s close. Hand-kneading – with the help of a dough-scraper, using ‘lift, flip, slap’ and/or ‘hand-wringing’ ways – is easy and satisfying. It’s even easy when someone forgot to add all the flour. I love the sound of the dough slapping down on Richard Bertinet’s ‘lift, flip, slap’ method that I learned from watching a video on gourmet.com. The slapping part isn’t particularly loud. There is just a nice satisfying *Plop* as the dough hits the board. The sound of the dough scraper on the board is equally satisfying – like listening to ice-skating. Outdoor ice-skating on a canal on a beautiful crisp sunny day. Please, turn on your speakers and take a listen so you can hear what I hear. 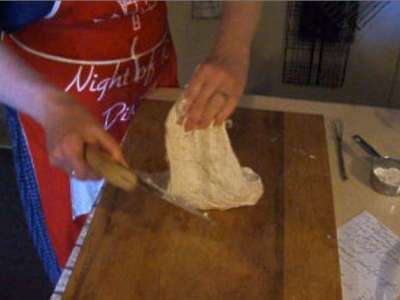 Please read more about hand-kneading slack dough and what to do if it seems like the sloppy mess refuses to look like dough. This entry was posted in baking, bread - yeasted & unyeasted, equipment and techniques, food & drink, Wordless and/or Black & White Wednesdays on Friday, 24 May 2013 by ejm. Love it! Love your bench knife, mine looks so puny in comparison. Love your kneading board too. Smiled all through the video. Thank you for showing the different kneading techniques. I had great fun watching you video. My dog hates the ‘popping down’ sound! Very funny video! Terrific! I love that you show you forgot the flour, the difference that made AND that this bread baking thing really isn’t rocket science. I would LOVE that bench knife!